If you’ve courted God-sized dreams for any length of time, you’ve discovered how messy dreams can get. One of my dreams as a mom (who happens to also be a work-from-home author and life coach) is to be truly present with my kids during the summer. Sounds like a good plan, right? Until the moment a couple weeks ago when that real life dream splattered all over my kids and back yard. My kids sat in their play clothes, wearing interesting configurations of repurposed shopping bags as protective gear for our summer activity that day: tye-dyeing t-shirts. As they finished slopping dye around the back yard, getting it on everything including their hair (I have punk-rocker daughters for a while until it fades out…) I was itching to spray them down with the garden hose. I reached for it, turned the knob, and SNAP. The pipe broke. My dream of quality summer time became almost too messy to cope with! The rest of the day was spent with no running water. We used a box of old baby wipes to get the kids in some sort of you-can-enter-the-house-and-touch-stuff shape. Dishes never got done that day. My nerves frazzled in proportion to the amount of trips to Home Depot it took to get the right parts to fix the pipe. What’s the dream, really? For me, it was quality time and a craft with my kids. Did that happen? Yes. Was the rest of the pipe repair, water issue, messy kids, stress about messy kids the point? No. The dream was the point. The rest was leftovers. What would this dream look like? In my mind, it looked like crafts with no mess. Like the picture on the tye-dye kit box, with the smiling, immaculate children who aren’t fighting with each other about who gets which bowl of dye first. But what about the dream that was deeper in my heart? It looked like laughter, fun, silliness, art, connecting with my kids, creating things together in the sunshine. Did all those things happen that day, burst pipe, stained fingerprints on my doorpost and all? Yep! Where’s Jesus in this mess? Peter reminded us of this reframing idea when his dream-of-the-moment found him sinking in the sea swell. Scripture records Peter saying what we all do in some form when the dream-mess starts to overwhelm: “Lord, save me!” (Matt 14:30). Out stretched the hand of the One who can make sense of the mess—or, at least, calm our messy hearts in it all—and up above the mess rose Peter. Like Peter, when we ask that last question, we feel God’s hand grabbing ours, reminding us we’re not alone in the craziness. 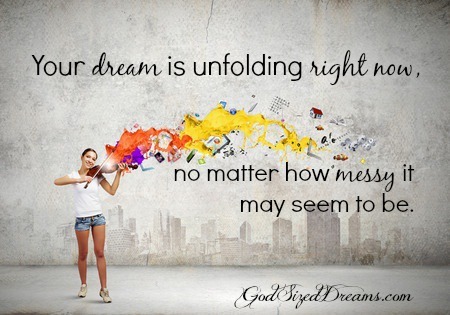 That with God’s help and some refocusing on the original dream, we can realize our dreams are unfolding right now, no matter how much of a mess they seem to be. such a good post, and an on point message to this mama’s heart. I could see this unfolding at my house too! working part time and juggling the pull of kids is a good thing…God is in it all. I love your points. Thank you! Reframing–what a great concept! I so often stress about the mess and miss out on the blessing right in front of me. Thanks for giving me a new perspective, Laurie! Oh Laurie!! I could see this all happening in my mind as I read – what a sight it must have been in person! I related to so much of it – thank you for the reminder that it’s in these places that our dream is unfolding! LOVE THAT! Oh, how I wish I’d been enough in my “perspective brain” to have thought to take pics. Then again, it’s really nice sometimes to forget the pics and make heart memories instead!